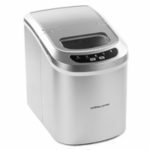 No need to run to the supermarket on a hot summer’s day to see if they have any packs of ice cubes left, with a portable ice maker machine you’ll have fresh ice cubes at your disposal in no time. 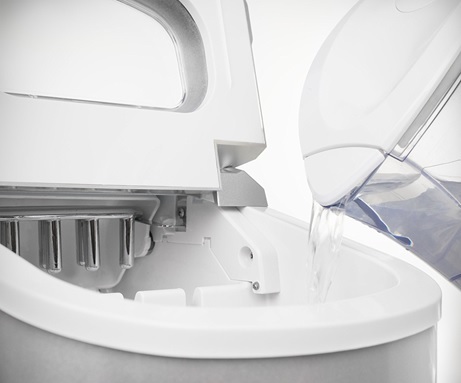 These ice cube maker machines are designed for home use and can produce ice in as a little as less than 10 minutes! 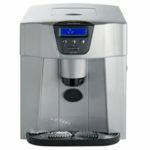 Over time you’ll also end up saving money if you use your home ice machine frequently, since you would have to pay for countless bags of ice otherwise. Alternatively, you can make your own ice cubes by freezing water in an ice cube tray but if you run out of ice cubes, it’ll take at least a few hour to freeze some more. Also the quality of ice produced from a home portable ice maker will be better as ice made in the freezer is usually stored next to food which can absorb food odours. A home ice maker is perfect for BBQ parties & events, trips away, lounging around on a sun lounger or filling up a cool box. 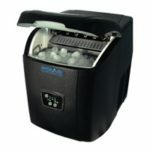 The way the portable ice machine works is pretty simple, you just have to plug it into the mains, fill up the water tank in the machine with water, wait for a few minutes with most models and ice cubes will be made in no time! If you’re unsure on anything then check out our FAQs section. Are you a fan of ice cold thirst quenching drinks? Then you’ll probably also like a soft serve ice cream machine for home use! 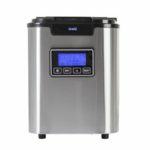 To ensure you choose the best ice maker machine to serve you well in the future, you’ll need to choose one with the right features and that will depend on what you want to use it for. Ice bin capacity – The produced ice from the machine will go into the ice bin where you can collect the ice at your disposal. 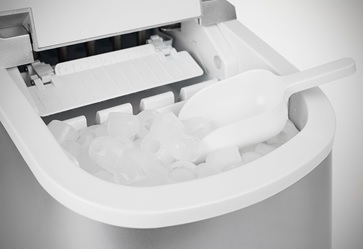 When the ice bin reaches its maximum capacity the machine will automatically stop producing ice, so if you want a large quantity of ice, you’ll have to empty the ice bin and freeze those ice cubes. Ice production time – Time it’ll take for the first batch of ice cubes to be produced, the machine will continue to produce more in intervals until the bin capacity is full. Total ice produced in 24 hours – Amount of ice that can be produced in 24 hours, of course the ice bin will have to be emptied out every time it’s full if you want to produce such volume. Ice cube sizes – Usually different sizes of ice cubes can be produced, however for crushed ice you’ll need to buy a separate crushed ice maker, which you feed the ice cubes into. LCD display – Having a LCD display just makes it a little bit easier to see what function is set on the machine. Scoop included – Used to empty out the ice bin and putting ice cubes into drinks as not everyone will be fond of someone else’s fingers touching their ice cubes. With most models however, the ice bin lifts out so you can empty out the ice easier. If a scoop is required or you prefer to use a different type of scoop, one can be purchased for very cheap usually. 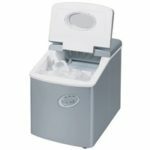 Dimensions – As these are table top ice cube machines, they can easily be moved around the house or even taken away on trips. Warranty – Should anything go wrong with your product, you’ll be covered by at least 12 months manufacturer’s warranty. Below we’ve put together a list of frequently asked questions, the FAQs won’t be specific to any particular model. Instead it’ll be general questions relating to the models shown in the table. Q – Do I need to connect the machine to a water supply? A – No, you just have to plug it into a mains supply and fill up the water tank in the machine with water. Q – Does the ice in the ice bin stay frozen? A – No, you’ll need to transfer the ice to a freezer or use it straight away otherwise it’ll melt. Q – Can it also dispense water? A – None of the models in our table dispenses water. Q – Is it able to make crushed ice? A – It can only make ice cubes usually small, medium or large.